Greek Baked Turkey Meatballs are a tasty appetizer or an excellent main dish. They’re insanely easy to whip up and a healthy option as well! This dish originally started as a one pot meal with rice. But it just didn’t work as well that way. I’ll be saving the rice for another day but I had to share these turkey meatballs. I’ve had turkey meatballs on my mind for about a month, since my last trip to Trader Joe’s. They have frozen turkey meatballs that are super easy to heat and delicious. We sampled some in-store and the girls went crazy for them. While I do like to keep a bag of those in my freezer, they also inspired me to make my own variation with a Greek twist. I find Greek flavors super fresh and delicious. Now it may be crazy snowy here in Rochester but I have spring on my mind. Perhaps I’m projecting my desperation for some sunshine in the form of a turkey meatball recipe? I don’t know, but either way you’ve got to try these. How do you make moist turkey meatballs? Use ground turkey with a higher fat content. Yes, it’s more fat but that also means more flavor and more moisture. Think of it this way, it’s still poultry. Mix in things that add moisture. Olive oil, lemon juice, egg. Onions or garlic. You could even add a little water if you need. While I included measurements in this recipe, I always go by feel and smell and I encourage you to do the same. Don’t overmix! This will make your meat tough. I once saw an episode of one of Ina’s cooking shows where she mixed burger meat with a fork and I think that’s brilliant. That way you’re not squishing the meat but rather “fluffing” it. What about a sauce for this turkey meatballs recipe? Why, I’m glad you asked! In staying with the theme, I like to dip them into Tzatziki sauce. This is a creamy dipping sauce traditionally made of yogurt, olive oil, cucumbers, garlic, salt and lemon juice. 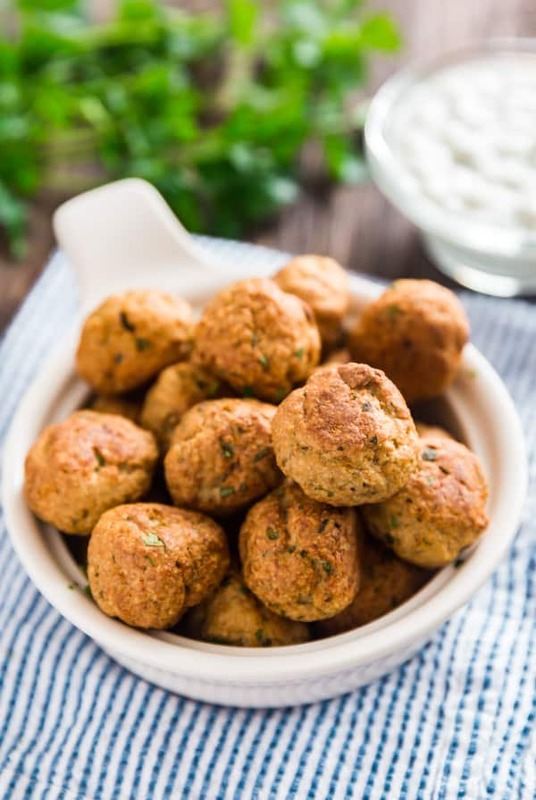 My friend Amy over at House of Nash Eats has a killer Tzatziki sauce recipe that goes super well with these meatballs! Make these as a tasty appetizer for game day or a party. Or let them be a simple protein for a light dinner! You can totally cook them and freeze to reheat at a later time or even freeze them raw. 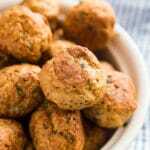 Greek Baked Turkey Meatballs are a tasty appetizer or an excellent main dish. They're insanely easy to whip up and a healthy option as well! Preheat the oven to 375 degrees and line a sheet pan with parchment or a silicone baking mat. 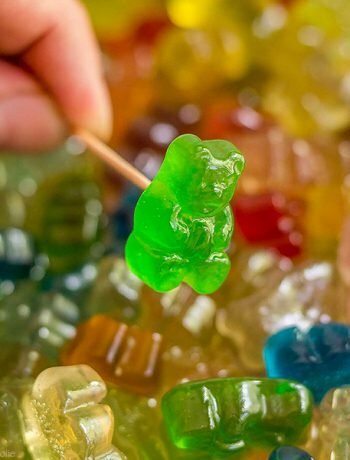 In a large bowl, lightly mix all ingredients with a fork until just combined. Form the meat mixture into 1 1/2-2 inch balls. Spread the meatballs out in a single layer on the sheet pan spray with cooking spray. March 20, 2018 at 9:09 pm These look like what great dreams are made of. I am a sucker for meatballs, yummy! March 21, 2018 at 10:18 pm Thanks Leslie- me too!